A common question from the Historical European Marital Arts community is one of how combat worked in warfare and how it applies to HEMA. What specific techniques that were used in war were also applicable to HEMA and vice-versa? The answer is - not much. 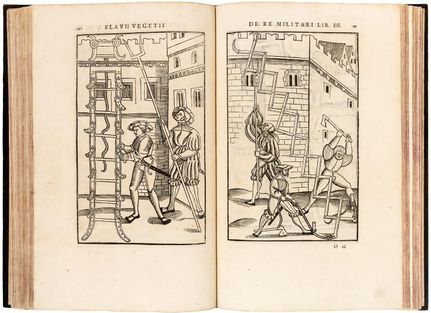 While there are exceptions and some cross-over, the majority of HEMA treatises are not directed at warfare when looking at the time period of roughly 1400 to 1750. This is because warfare is less about combat techniques, and more about organization and overall training. War and HEMA are not the same, though they share a frontier and sometimes cross it. Example, if in a war and facing one opponent, HEMA applies, but less so when facing 10,000. In Europe, how to conduct war up until the advent and increasing use of gunpowder was based on Roman texts. After the fall of the Western Roman Empire, literacy in Europe collapsed, leaving only the most wealthy and the clergy with the ability to read and write. Learning was transmitted more often through doing, rather than reading. When it came to military literature, there were few options. De re militari (Epitoma rei militaris) was written by Vegetius in the mid 400s, just as the Western Roman Empire was collapsing. After Rome's collapse, the book remained and continued to be cited as suitable military work into the Renaissance. The book does not focus on specific fighting, but instead of all that is needed to outfit, prepare, and direct an army. "They were likewise taught not to cut but to thrust with their swords. For the Romans not only made a jest of those who fought with the edge of that weapon, but always found them an easy conquest. A stroke with the edges, though made with ever so much force, seldom kills, as the vital parts of the body are defended both by the bones and armor. On the contrary, a stab, though it penetrates but two inches, is generally fatal. Besides in the attitude of striking, it is impossible to avoid exposing the right arm and side; but on the other hand, the body is covered while a thrust is given, and the adversary receives the point before he sees the sword. This was the method of fighting principally used by the Romans, and their reason for exercising recruits with arms of such a weight at first was, that when they came to carry the common ones so much lighter, the greater difference might enable them to act with greater security and alacrity in time of action." While he values the thrust, he does not discount the use of the edge as described in the post exercise and later on the subject of drilling recruits. Vegetius suggests that soldiers train in a drill called armatura, and notes it was still practiced in his day, but not enough. What exactly the armatura is, he does not specify. He spends more time on other things he finds valuable to soldiers. Not fighting as much as, being able to vault onto a horse, being able to swim, being able to load and fire a weapon, being able to march long distances and carry burdens as well as entrench at night. All of these were hallmarks of the Romans in the days of Julius Caesar, but in Vegetius' day, the army had much declined as he states over and over as a warning to its reader. The rest of his book is about army organization, ranks, siege-craft, how to prevent mutiny (don't give the men time to be idle), how to cross a river, and so forth. Discussions of combat are vague, such as this description of how a general should drill his soldiers. "The recruits likewise are to be exercised with wooden swords at the post, to be taught to attack this imaginary antagonist on all sides and to aim at the sides, feet or head, both with the point and edge of the sword. They must be instructed how to spring forward to give the blow, to rise with a bound above the shield and then to sink down and shelter themselves under cover of it, and how to advance and retire. They must also throw their javelins at the post from a considerable distance in order to acquire a good aim and strengthen the arm." Another Roman Era book that was similar to de re militari was Strategamata by Frontinus. This work is mostly a series of chapters, such as, how to get an army enthusiastic about battle, and then giving historical examples of this. Of training and actual combat, there is nothing. How well-known De re militari, or Strategamata was during the post-Roman era is not in question. The works were copied repeatedly well into the Renaissance. How well were they followed is another matter. Charlemagne (742-814) may not have been able to read, but he had men around him who could and he was aware of De re militari and Stragemata. Copies of which were made during the Carolingian era. Charlemagne's army was noted for its ability to march, to hold ranks and maintain discipline and conduct maneuvers in the field of battle as well as use technical skills to besiege enemy walls. None of this could have been done without rigorous training and clearly Charlemagne's men knew how to fight. One of Charlemagne's men, for example, said that the King directed him to train all laymen in war using, "ancient learning", while the clergy would be taught how to read holy scripture. By the 16th century, the advent and common use of gunpowder made the works of the ancients less valuable. New books were written. Machiavelli, for example, wrote his own treatise on how war should be conducted. It was scoffed at by the leading condottieri (Italian mercenaries) of the time and the work was much like De re militari, in that specific training and combat techniques were not discussed, but how to march an army through Italy's hilly terrain was. During 16th and 17th century numerous treatises were created on the use of pike and shot warfare. Robert Barret in 1600 wrote the Theorike and Practicke of Moderne Warre (before there was a theory and practice of standard spelling) in which he describes all that is necessary to understand war in the age of gunpowder. Virtually nothing is spent on combat techniques, and of the sword, he says all soldiers should practice their arms, be it pike, musket, sword and targe- but how exactly this should look is not mentioned. Important - yes. Important enough to write down - no. Like de rei militari, Barret is more concerned on army organization and discipline than combat itself. Overall in military writings, details are lacking when it comes to personal combat. A prime example is the use of the larger, two handed swords. These weapons, called montante, zwiehanders, and by other names were military grade heavy swords that were used in two hands. 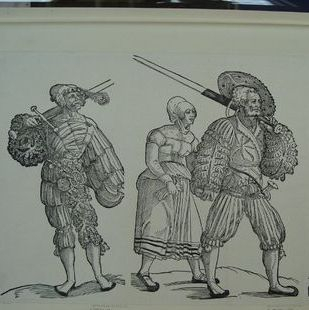 Landskneckts (german mercenaries)who used them were called Doppelsoldner because they were paid twice as much as a regular pikeman. What exactly they did is not known, but heavily theorized upon. In 1651, Diogo Gomes de Figuereydo wrote rules for how to use the larger swords and here, the cross-over between military and something else appears. "This rule serves to deter people in a street and impede them moving from one end to another. Give a talho forwards in the direction where the people are, with a step forwards, in such a manner that you cross the road, and walking forth, when moving the same foot forward you will give another talho like the first. Turning to cross back over the road, you will face the same direction again, giving a revez with the right foot, and with the same foot following it with another. If the road is wide, in order to take it all, you will give more revezes or more talhos in the same manner. " He goes on to describe how to fight against another montante, a rarity in his own words, and how to fight against men with shields, how to clear streets, protect a lady, disperse a crowd or stand over a comrade and keep them safe. Specific techniques are called for, and the field of war has been replaced by something a bit different. Dueling it is not, and personal combat it is not- but it isn't meant for the ranks of pike and shot either. There are other outliers as well. Johan Jacobi's depiction of warfare in Kriegskunst zu Fuß does show specific examples. Like the prior writers, things like how to cross a river are noted, but also, specific techniques in a war-time setting are shown including single-combat. Still, looking at the majority of military writings, precious little describes specific techniques in terms of swordplay. The 'why' behind the lack of specific techniques in military settings is perhaps best summed up in the late 18th century. When Napoleon invaded Egypt in 1798, the French were impressed by the Mamelukes; desert warriors known for their riding ability and swordsmanship. Napoleon (supposedly) said that one Mameluke could defeat a French curiassier. That five could prove a challenge, but that ten or more French curiassier would defeat ten Mameluke's with ease. Napoleon's cavalry units operated in much larger numbers than ten men and the French were triumphant over the Mamelukes. The point is clear, - personal technical skill, and the personal knowledge of techniques, loses its value when the number of soldiers increase. Formations, training, and discipline beat individual skill. This is why military treatises are not always very useful in a HEMA context because the actual fighting is not as important as other parts of warfare. There is cross-over however, like Figuereydo and Jacobi who describe or show smaller scale actions more relevant to HEMA. However, for those wanting to learn HEMA, military manuals, much like art depicting war, may provide very little and the context has to always be kept in mind. Knights had to know about military matters as well as individual combat and it is from them (or rather for them) that we find early HEMA sources. The Marshal of France, Jean le Maingre, known as Boucicaut (1366-1421), who dueled one of Fiore de Liberi's students, the condottierie Galeazzo, had accounts of his training. Boucicaut was the very model of a knight. Brave, brash and ready to fight. He was not trained with large formations of men, but rather, trained himself and had to be able to fight in war, but also in duels of honor, such as his two fights with Galeazzo. "And now he began to test himself by jumping onto a courser in full armor. At other times he would run or hike for a long way on foot, to train himself not to get out of breath and to endure long efforts. At other times he would strike with an axe or hammer for a long time to be able to hold out well in armor, and so his arms and hands would endure striking for a long time, and train himself to nimbly lift his arms. By these means he trained himself so well that at that time you couldn't find another gentleman in equal physical condition. He would do a somersault armed in all his armor except his bascinet, and dance armed in a mail shirt... When he was at his lodgings he would never ceased to test himself with the other squires at throwing the lance or other tests of war." 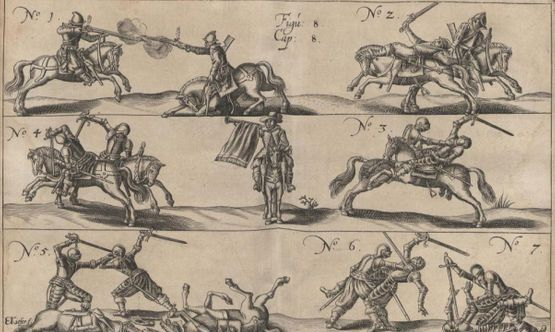 For knights, beyond personal training, mock-war was where they learned to fight. In the 1100s, these games included large-scale mock wars between knights where the goal was to capture opponents and then ransom them. The games were deadly affairs to begin with, but by the 1400s they had become largely (though not entirely) bloodless affairs in Western Europe. How exactly they fought is not detailed, and they did not learn through reading, but through personal training and experience. Pierre Terrail, known as Bayard (1473-1524), was one of the most famous knights of his day. He started off as a page to Duke Charles of Savoy. He was introduced to the King of France, VIII and soon became his page. He was full of courtly graces and was promoted and eventually fought in tournaments. In one case, he challenged all comers in a joust and defeated a grand total of forty-eight opponents.There are plenty of stories of his exploits in battle, in duels and in overseeing duels, but little in the way of technical detail. Like Boucicaut, his training would have been personalized and then enhanced through experience. Where we begin to see techniques comes from dueling, not from warfare- although there could be cross-over. What applied in one area could apply in another. In Liechtenauer's Zettel there are specific techniques described for combat. These techniques are explained in glosses by later masters. The art being taught is called knightly, and the introduction is to a young knight, but the Zettel is not about how to fight in a war, it is how to fight in a duel, with one opponent facing another with the same type of weapon. By the time the Zettel was written, the sword was fast becoming obsolete on the battlefield. This isn't to say they were abandoned, or not used at all, but there was a greater and greater sense that the sword was the least important arm, and this is lamented by later masters and some, such as Fabris, simply shrugged and declared the art of fencing far from the ramparts of war. Fiore de Liberi's Flower of Battle, written in the early 15th century, is a treatise that covers specific techniques with a wide array of weapons. Like Liechtenauer's work, it is not for war. Nearly all the combat depicted is between men with the same weapons. There are no examples of multiple opponents, and where three men are depicted in attacking the Master, the Master notes that his opponents are coming one by one, not all at once. What the book is for is mostly dueling. Fiore names his students and the duels they fought in, which includes Galeazzo who encountered Boucicaut twice. There is some cross-over into self-defense and perhaps some military applications, but by and large dueling is the focus. In one play (technique) Fiore describes how to stab a fleeing opponent who is heading for their fortress. This is not a duel, nor self-defense, but rather some form of skirmish. Not much else is revealed as to the context of the play and no other play in the Flower of Battle reads quite the same way. Fiore's work does have self defense aspects to it. Such as the use of branches and a dagger against a spear-wielding opponent. However, the majority of the Flower of the Battle appears to be in the context of a duel. Fiore was no stranger to war, having raised troops in his lifetime, but his treatise is not about that. His named students are noted for their duels, not their battles. 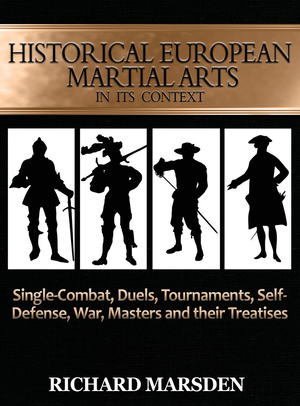 Again, there is a clear differentiation between warfare and Historical European Martial Arts. They are not entirely divorced, but how to fight in a battle and a duel are not the same thing, and most HEMA sources are for the latter. In the 16th century, the state of fencing in the Holy Roman Empire was, if the masters are to believed, in a state of decline. Fencing guilds were being replaced by shooting clubs, and fencing as a whole was seen as of little value in warfare and more useful in defense of one's self, or in dueling. Mair, in the introduction of his massive treatise, regales his readers as to the history of the knightly arts, claiming it to be tied directly into the Greeks and Romans. Of his modern day, he laments the decline of fencing and that soldiery have given themselves to drink as well as new habits that have weakened Germany as a whole. "...all sorts of new-fangled arts, as for example the pernicious shooting, are seen in this our time, of which the princes and lords now make avid use in warfare, by which the knightly art is sorely weakened and there is a sore decline in the supply of brave heroes." Meyer, who also wrote in the 16th century, echoes the sentiment. He claims that the knightly art was in much decline, partially because it had never been easy to write down, or written about before. When Mair and Meyer say 'knightly art', they mean fencing, and Meyer goes further to indicate it is manly, and meant to be when one opponent fights another - not when groups of men are fighting. In the Holy Roman Empire, England, the Netherlands, Italy and France, guilds or schools were formed that taught the use of arms. In theory, these guilds and schools were meant to get the populace trained for war. However, gunpowder and a greater reliance on either mercenaries, or state-troops, made the whole practice come into question. Fencing became less about war, and more for sport, civilian defense or much to the annoyance of the state and church, dueling. Thus, when Mair and Meyer introduce their works, there is a clear desire to bring the knightly arts back into fashion. Meyer, who opened a fechtschule (A fencing school that held a form of sport-fencing) believes fencing is something all soldiers should learn. Mair says fencing is manly and served the ancients well and should be taught in his day. Neither speaks of warfare- such as how to fight in a unit. The writing of Mair and Meyer are not explicitly about war, but about personal combat. Neither probably envisioned a unit of men with longswords charging out into battle against pike and shot! Where HEMA is to be found is in the culture of dueling. One on one combat does have limited value in warfare and can be used in self-defense, but it is the duel that looms large over the more popular forms of source material. Liechtenauer and Fiore are meant for dueling, with Fiore out-and-out stating the names of some of his students and who they fought in a duel. In the 16th century, the duel became a craze in places like France, and the spread of Italian rapier with its deadly point was lamented by both Meyer, and more famously by George Silver. Joseph Swetnam in the 17th century notes that the ancient arms were lying rusted in a corner and Fabris, a titan in the use and instruction of the rapier, notes that what he teaches is for gentlemen and not for the battlefield. Some masters claimed they were, in the manner of older masters, training the population for warfare, but like so many treatises, the combatants are fighting with matched weapons one on one. Discussion of multiple opponents are rare, and not in the context of a battlefield. 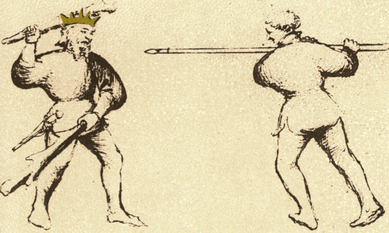 Giganti, in his second book, notes how to keep multiple attackers at bay with the rapier, but the rapier is not a weapon of war and the rest of his work is in the context of the school, a duel, or self-defense. Repeatedly, masters of the 17th century and beyond have to justify their works as not, books on murder, but on gentlemanly self-defense. Anti-dueling literature of the day makes it clear however just what was driving the interest in fencing. While HEMA extends before 1400 and exists after 1750, the bulk of HEMA practitioners today fall within that time frame. Looking at treatises on warfare, very little is said of personal combat. Its importance clearly paled in comparison to overall training and army organization and structure. This is seen in the popular works before the heavy use of gunpowder, and after. This was not a matter of one writer's personal preference, but a general trend. There are outliers, but by and large, war and HEMA are not the same and those studying HEMA should understand this. The HEMA source material between 1400 and 1750 may have some battlefield applications and some self-defense use, but by and large the material depicts one on one combat with matched weapons- a hallmark of the duel. Just as military writers spent little time on specific combat techniques, the writers of the various HEMA treatises spent little time on warfare - and in some cases, discounted it entirely. The why of it, is because individual martial skill counts for less when more and more people are involved, and unit discipline and cohesion counts for more. Into the modern era this was noted. In DA Kinsely's work on examples of British swordsmanship in the 19th century, he has an account of a particularly skilled man might find himself overwhelmed in a war, as the enemy instinctively focused on him. In other accounts, where single combat takes place between two opponents, the commentators noted how odd it was to see men fencing as if they were in Angelo's school. More often than not, single-combat was agreed upon by champions. Depictions of melees involve more brutal, effective hacks and slashes and thrusts, than 'noble' fencing. However, while war and HEMA are distinct, and often only tangentially related, that is less the case after the period of 1750. The 19th century brought about newer military manuals that did discuss fencing. Sir William Hope, for example, noted that the soldiers were largely illiterate and simple was best, and so simple he shows. Saber treatises do show some techniques, such as the slip of the leg, or describe parries and attacks, but if the sword's value was questioned in the 16th century, by the 19th, it was fairly clear that the day of the blade was fast ending as muskets, rifles and artillery only improved. Holzman's work, The Art of the Dueling Saber, is a fine book to read if one wants further information on the context of 19th century material and why military men, even in the age of modern guns, were learning how to fence. 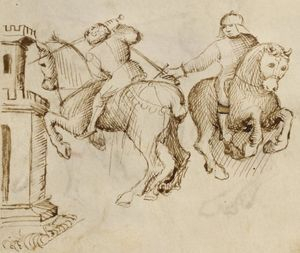 Jacobi's depiction of cavalry at war- however, the combatants are shown one vs one, in what amounts to personal duels on the battlefield. Want to learn more about the context of HEMA? HEMA, from war, to duels, to tournaments and more!